This is an article for your orientation. These are basic guidelines that you MUST know before you begin attempting the test series. Whenever you have doubts regarding your performance or the standards/approach of the test series, please read this article. 1. Polity: We are using Laxmikanth 4th Topics in the newer edition will also be covered. We will notify accordingly. It was important for us to write this because of the different attitudes and expectations aspirants hold towards this test series. It is extremely difficult to fulfil everyone’s expectations, especially when they are misaligned with the objectives of the test series. If you understand the purpose behind this test series, you can easily come to terms with the coming several months, which can be exciting as well as unsettling, depending on how you view this test series. 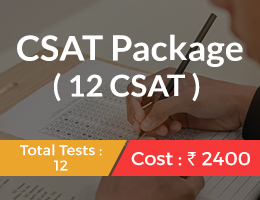 Score as a parameter of performance: The whole point of doing this test series is to add an important resource to your preparation. It is to get that extra buffer so that you can mark those critical questions in the final exam that might be difficult to find in conventional material. It is not just a mock test series! This is a Prelims Guidance programme spanning over 10 odd months. If you have attended any of Insights previous year test series, you already know what we are talking about. Your scores really do not matter as much as your relative rank does. Keep a track of your rank; only if your rank goes down is it a matter of concern. Scores will keep fluctuating; it’s a standard trend across even the actual UPSC prelims examinations. Don’t be disheartened if you can’t score even 50 marks. We cannot emphasize the importance of this aspect more because this is where most aspirants get stuck. 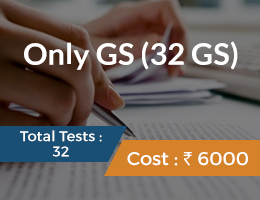 They score low in the first test and then stop taking tests altogether thinking UPSC is not their cup of tea. Please do NOT do this! Absolute caution! Scores will improve with time, and the definition of what is a good score also varies from test to test. We will let you know in the discussion pages, when appropriate. Golden Rule – No judging: Don’t judge your performance for the first 15 tests! That is a golden rule that you MUST follow. If you start judging, you will start to focus more on increasing your scores and less on learning. 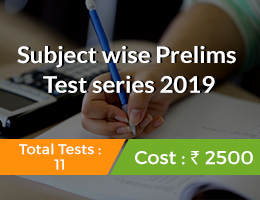 This is not just a mock test series where you evaluate what you have already learnt; this is a resource: carefully researched study material that would help you expand your knowledge base. We would like to emphasize again – Do NOT treat this merely as a test series! This is perhaps the biggest mistake you can make concerning this whole 10 months programme. Learning curve would be gradual, but robust. You would realise after 15 tests that you know so much more about your course material than you would have known had you followed only the standard sources. This alone should make you feel more satisfied about your preparation. Level of difficulty: Several concerns were raised last year that the difficulty of Insights papers was unrealistic and UPSC paper is far easier and sticks to the basics. We hope that this year’s UPSC paper would have dispelled that notion. 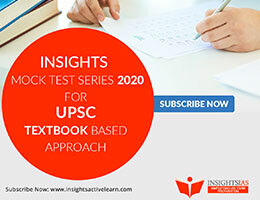 So, the difficulty level for the 2019 Test Series will be higher that UPSC papers and even past year Insights papers. We will step up the difficult level gradually though; the initial 4-5 tests may not be so difficult. If you find that papers are not balanced in terms of difficult level, please understand that it was intentional; it was designed to be so. No complaints with regards to difficult level, please! It is not to prove that we can design difficult tests, it is solely to help you face such questions in the examination. Unconventional portions: With the 2015 to 2017 UPSC Prelims papers, you would have come to realize that the weightage of static portion will go down considerably as UPSC exhausts its traditional base of questions and moves to more dynamic sources. We have always relied on this idea when framing questions, and it has not disappointed us till date. 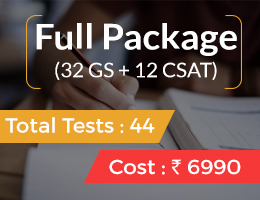 Little value is served, if we do not include questions in the test that are probable for the coming exam, even if it is at the opportunity cost of traditional revision-based questions. So, you would keep encountering new questions/topics/ideas in the coming mock tests; be prepared. It is to help you, not us! Don’t be surprised or frustrated. It is better to feel insecure by scoring low in these tests than by a false sense of security with high scores. 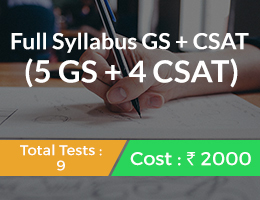 Sitting with the test solutions and making Notes: Spend time with the test paper and detailed solutions. This is one of the most important and usually neglected part of the whole programme. Once you complete a test rather than jumping to conclusions and commenting on the platform about the usefulness or standard of the test take time to review the whole test. We recommend at least 4 to 5 hours because you have to go through a 100 page dense material (both Qs and solutions) compiled after several hours of painstaking observation and research. Give the document its due respect. Highlight useful portions and make quick notes. Do not wait for tests to pass to make notes. Students finish the entire test series and then find it extremely difficult to revise it at the end moment making it an exercise in futility. If you already have short notes made from this dense material it is so much easier to revise it. So many questions in the last Prelims 2018 could be answered easily had someone revised these tests properly. Lack of frequent revision can cost dearly in the final exam. Making the most out of the Discussion Platform: You are now a part of this community of thousands of aspirants. Make use of the platform to clarify your doubts, get tips from fellow aspirants and build useful connections. This is one of the greatest assets of joining this test series the online discussion platform. You can post whatever doubts you have regarding the questions asked in the test series. We will try our best to address them within 1 or 2 days. Please tag us @insightsprelims in all such comments else there is a high likelihood that we will miss the comment. Also, if you are attending tests much later than their due window, tagging us is in a doubt is a must. It is difficult to monitor every single test discussion page every day. Tagging makes it so much easier. It is possible that if your doubt has already been addressed in the discussion page previously by us or fellow aspirants, we will not reply to your comment because we assume that you have gone through the discussion thread and are aware of the resolution. Keep reviewing the discussion page for new comments. Please take due note of this fact. It is highly inefficient to address the same doubt individually over and over again when the answer could be easily found by scrolling comments of your peers just a few lines below. Even if you cannot check discussion pages regularly, there is high likelihood that you would find an answer to your doubt in the clarification document uploaded on the blog. There will be constant communication from Insights. We will keep guiding you with articles on major issues that we find during the test series. It will not be a one way process where we merely give you questions to attend the tests. Since this is a serious discussion platform, please avoid asking too general questions about preparation. If you have joined this test series, we already assume that you have researched well enough on the basics. No premature judgments: Look at the test series as a whole rather than looking at it in parts. If you do not like a test because of its partial coverage or difficulty level or even weirdness, understand that there is a reason why things were done in a certain way or topics were covered in a certain way. It is what you take away at the end of the whole programme. An individual test is not so important as the whole test series. Have trust in your mentor and keep walking. You would know for yourself when you finish the programme. Do NOT make premature judgments by seeing things in isolation and labelling tests as good or bad. Keyword Research and coverage: Note that the questions asked will not be confined only to the exact text given in your syllabus material. We will also pick up keywords from the material, research them and put questions based on concepts/information/facts given in the material. So, you need to research your material thoroughly. A mere reading is unlikely to be helpful. Also, there might be several statements, as parts of the question, that are picked up verbatim from the material. We would modify a statement only when it can be put up in a better way, else you are likely to see statements similar to how they appear in your book. This is how UPSC does it and this is how you should be learning it. It is best to stick to the official version of things. It makes things easier for all of us. Corrigendum: Clarification document for each test will be uploaded before the test widow closes. A combined corrigendum will be posted after every 10 tests. Please feel free to point errors or typos in the test. We would also like to hear different perspectives. If you think a question could have had a different answer, do let us know. Keep your comments precise and relevant so that it is easier for us all of us to follow and implement. 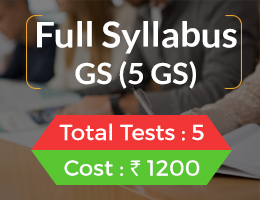 The whole model of the test series has been revisited including the way we are covering sources as well the way in which we have divided the syllabus. The test series would go a little lateral this time trying to cover deeper as well as wider areas while sticking to the basics. This is to keep up with the challenges UPSC throws at you. Do not prematurely judge either the tests or your scores. What matters is how much you learn by the end of the programme. Spend at least 4-5 hours with the test material and make regular notes. It is extremely helpful for revision. Difficulty level will be on the higher side and there will be a number of unseen/unconventional topics being asked in the tests. This is in accordance with the present exam pattern. Tag us in doubts and comments, especially if you are attending tests after the due 10 day window. Keep checking the forum for doubt redressal. If a doubt has already been addressed, it is unlikely that we will keep replying to the same doubts asked by new users again and again. Test clarifications will be regularly updated. Questions asked will not be confined only to the exact text given in your syllabus material. We will also pick up keywords from the material, research them and put questions based on them. Read the text with due research. A mere reading is unlikely to be helpful. Please feel free to post your doubts here. We begin the journey in less than a week. Make effective use of the test series. Wish you All the Best! Next story Insights Weekly Essay Challenges 2018 – Week 27: Sometimes it takes a natural disaster to reveal a social disaster.